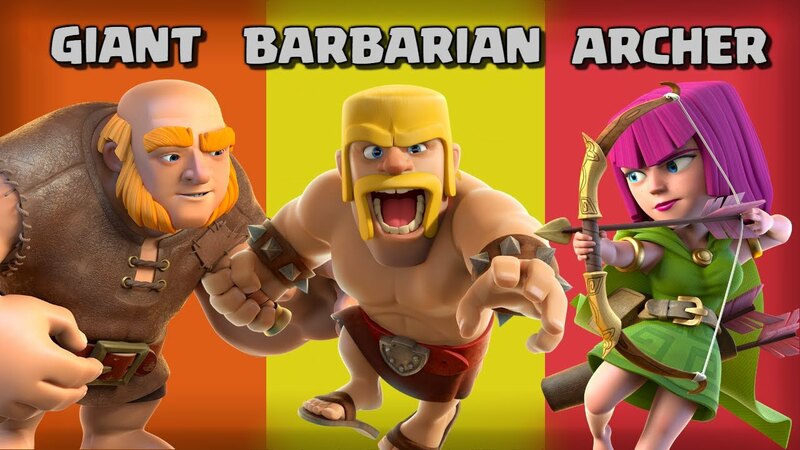 Over the past week, Clashers have been challenged with the GiBarch event. To earn the bonus XP and gems, players were tasked with using a set number of Giants, Barbarians, and Archers on 10 successful raids. The event was a surprising for two reasons. First, most events over the past six months have ignored the lower Town Halls, focusing on higher level troops and spells. The GiBarch event was the first that every TH could participate in. Second, the challenge pitted an attack strategy from Town Hall 1 and placed it up against Inferno Towers and Eagles for the games top players. An interesting spin on the usual Lavaloon or Mass Bowler attacks we typically we at those levels. So, was GiBarch effective at the top Town Halls? Is it worth continuing well past the event? Regardless of Town Hall level the GiBarch strategy basically works the same way, and can be effective even at Town Hall 11. The major difference one you reach Town Hall 8 is incorporating your Heroes. The ideal base is one either with collectors on the outside and/or easily accessible storages using Wallbreakers, the Earthquake spell or a Jump spell. GiBarch is not a trophy pushing army, and as such, players should not be concerned with stars or taking out a high percentage of the base. Resources are the target, and ideally one star in order to receive part of the league bonus. If hitting a dead base or one where the collectors are all on the outside, often times just your Barbarians and/or Archers are enough to capture those resources and move on. Spamming the rest of the troops on non-resource buildings just to get the 1 star may not be worth the effort or gains – it is a judgment call on the base and the percentage you are currently at. When targeting storages using GiBarch, determine which side of the base gives you access to the highest number of storages. Keep in mind that the Town Hall holds 20% of all three resource types. First spread out your giants along that side to begin tanking. Then support the giants with a few Barbarians and Archers along the ends of your line to help create the funnel. As those outside buildings are falling send in your wallbreakers or use the EQ or Jump spell to create access to the targeted storages. From there release on mass any remaining Barbarians, followed by the Archers, using the Barbs to help add extra tanking support. If you can avoid using spells, do so, as it will only increase your gains. However, you have to gauge the reward vs. cost in real-time. If there is another Gold storage hold 50k, and that is your primary target, then spending another 20-30k on a Heal spell is worth it. Incorporating your heroes can follow two strategies. First, simply drop the Barb King as a lead tank once you are entering the base. If you have an Archer Queen and/or a Grand Warden, place them behind the BK to increase your attack into the center of the base. Another approach, which costs more elixir, and requires an AQ level of 10+ or so (to be truly effective) is using the Queen Walk to create one side of your funnel while also targeting resources behind enemy walls that you do not plan on breaking through. At Town Hall 10 and 11, this tactic can be especially lucrative allowed the Queen to walk for at least a minute and using Rage Spells on the Healers for support. Often she will (a) create one side of the funnel, (b) take out 15-20% of a base (a league bonuses based on percent are more worthwhile as you climb up the rankings), and (c) allow a portion of the base to fall without trigger the Eagle. Regardless of your Town Hall level, remember GiBarch is a quick and cheap army to train, especially profitable, when you can raid multiple times in a row to rack up resources before your shield and Village Guard are gone. Very effective for quacking racking up loot, especially if you drop down a few leagues. The second season of the Champions War League recently concluded, and the Dark Looters took home the title – repeating as champions. During their impressive final victory they rolled out the TH10 Dragon Clone attack while great success. If you have TH11s in your clan, try using this new attack strategy for dipping down to three star the opponent’s Town Hall 10s. The basic idea is to have your Archer Queen take out one air defense and create one side of the funnel, while the Barb King creates the other side. Then deploy balloons to soak up the air mines with Dragons behind them. Using rage and haste push the dragons into the core of the base, dropping the clone spell on the dragons once in the middle. Take a look at YouTuber ClericDragoon Gaming with a few examples.